Rated R for crude sexual content, language throughout, drug use and brief bloody images. Dying is easy, comedy is hard, as the saying goes. A comedy in which someone dies—specifically, a male stripper at a bachelorette party that goes horribly wrong—is an especially tricky feat that “Rough Night” never quite pulls off, despite a few glimmers of greatness and a game cast. Director and co-writer Lucia Aniello aims high in going low-brow with her first feature; she’s best known for writing and directing episodes of the awesomely inappropriate TV series “Broad City.” But she has trouble making difficult tonal shifts between raunchy humor, serious drama, slapsticky action and feel-good heart. “Rough Night” starts out buoyantly, and it and features some wonderfully weird moments scattered throughout. But those scenes never truly gel with the movie’s eventual life-or-death stakes. By the time things get real, it’s difficult to care about whether these characters survive because they’re so thinly drawn. The ambition is also clear, though, as is the caliber of talent Aniello has amassed for her ensemble cast. It’s certainly taken long enough but it’s exciting to see a rare, R-rated comedy with a woman at the helm and a strong, female cast. Scarlett Johansson, Jillian Bell, Ilana Glazer, Zoe Kravitz and Kate McKinnon are down for whatever and they bring an appealing, eclectic mix of energy to the screen. If only they had more to do than flail from one wacky scenario to the next. The script from Aniello and Paul W. Downs—her longtime creative and romantic partner, who also has a supporting role as Johansson’s fiancé—feels like it’s composed of bits of other raucous films from “The Hangover” to “Weekend at Bernie’s,” even as it aims to be more than just a female version of a specific type of male-centric comedy. In between the wild set pieces, the pacing drags as the ladies struggle to rekindle their lost friendship. 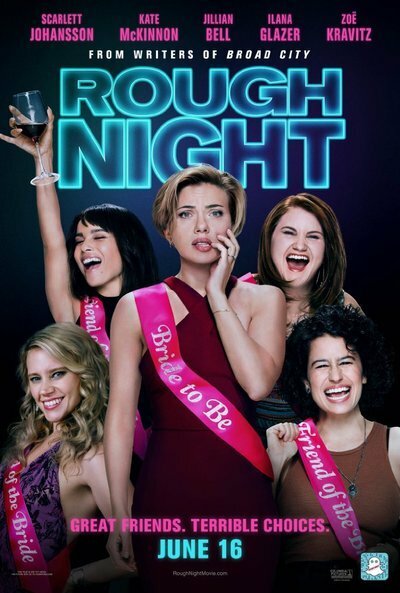 “Rough Night” starts strong, though, in 2006 with a glimpse of the crazy, booze-infused connection that bound these women in college. A decade later, Johansson’s Jess is running for state senate and is about to get married to the kind and patient Peter (Downs). The party has been over for a while, it seems, as evidenced by her conservative clothes and awful ad campaign. Johansson is so naturally engaging, though, she finds a way to bring her smarts and timing to an unusually ordinary role. But Jess also invites along a close friend from her summer abroad in Australia: McKinnon’s Pippa, whom the jealous Alice insists on calling Kiwi. While fellow comedians Bell and Glazer have made their names going to strange and inspired places, McKinnon is—as always—the irresistible scene-stealer of the bunch, with her intentionally terrible Aussie accent and a fearless physicality. And yet, all these talented actresses can only do so much with what’s on the page. Pippa is the New Agey flake. Jess is the responsible leader. Alice is the needy attention seeker. Glazer and Kravitz are afforded even less characterization: Frankie is a tough-talking activist and Blair is … wealthy? High maintenance? We’re told that a tension simmers between the two because they’re estranged lovers, but we never really feel it. They quickly get yanked from their buzz, though, when they hire a stripper on Craigslist (Ryan Cooper) and … accidentally kill him. And it really is a record scratch from which the film as a whole never recovers, despite the ladies’ many zany attempts to hide the body. It’s not that the death itself is shocking. It’s that trying to mine that death for dark humor—while simultaneously acknowledging its gravity—makes for a muddled tonal mix. In the middle of their feeble efforts to cover up their crime—which, naturally, only get them into deeper trouble—Jess and her friends stop everything to sit around the living room and rehash their resentments of years past. Aniello has said that “The Big Chill” was one of her main inspirations in making “Rough Night,” and you can kinda see that in these scenes. But because we barely know these characters—and they barely know each other anymore—such supposedly emotional moments carry little heft. Similarly, the warm and affirming way the film wraps up feels tacked-on and unearned. A dead man is at the center of “Rough Night,” but the women forced to deal with him never feel truly alive.